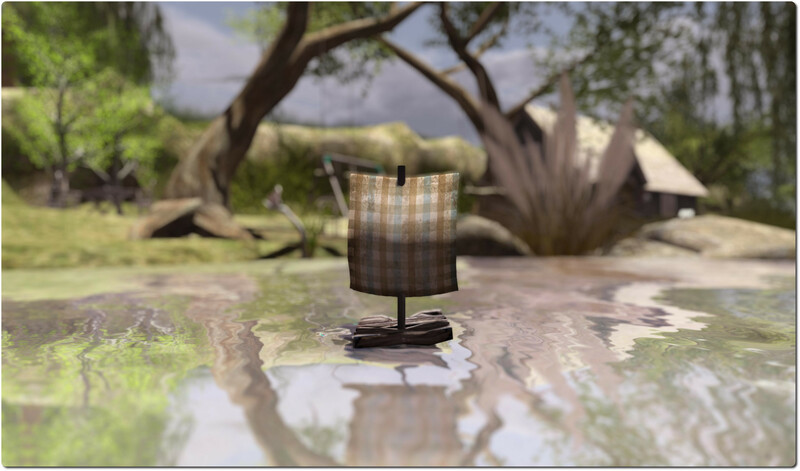 I have a new obsession in Second Life. 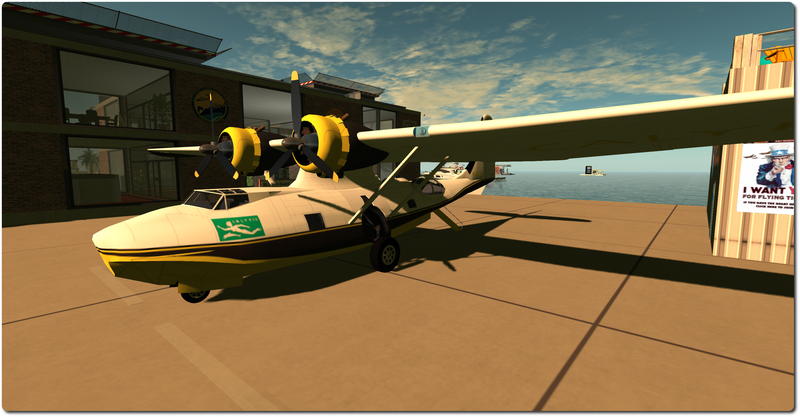 It’s my PBY-6A Catalina flying boat – although the admission of the obsession probably comes as no surprise to regulars on my SL feed of late *coughs*. I reviewed the Cat toward the end of August, commented that I hoped someone would produce a paint kit with RAF colours, because although the Catalina comes with UV maps, etc., so you can paint it yourself, I’m not sure I’m up for the cut. 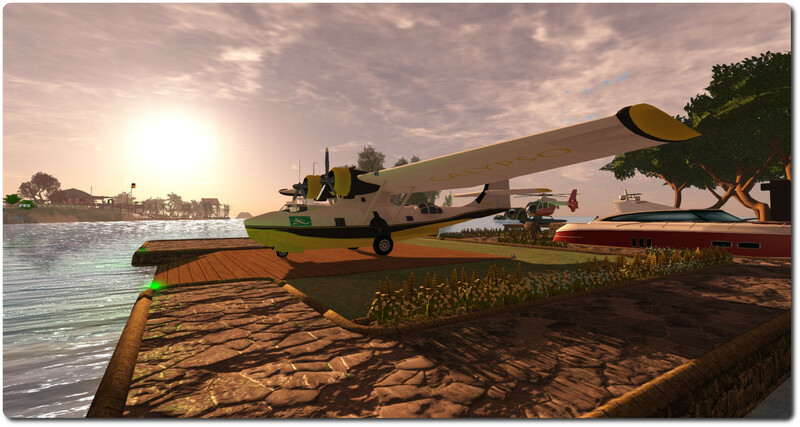 Fortunately, fellow SL aviator and friend, Terag Ershtan, alerted me via Twitter to Josh Noonan, who produces a range of paint kits for various customisable aircraft, including the Shana Carpool Catalina. Josh is based on Hollywood Airport, one of my regular spots for starting / ending flights, so I hopped over to see him. And indeed, there on the wall of his hanger was a vendor which included a range of paint kits for the Catalina – although none in RAF colours. Even so, there was one in the Cousteau Society’s markings, which I simply had to have. Purchasing it, I mentioned RAF colours to Josh, and he said “got any examples?” Well, I didn’t, but it was one of those times I knew Google was my friend, and so passing him a couple of links, I went on my way to paint my Cat in Cousteau colours. 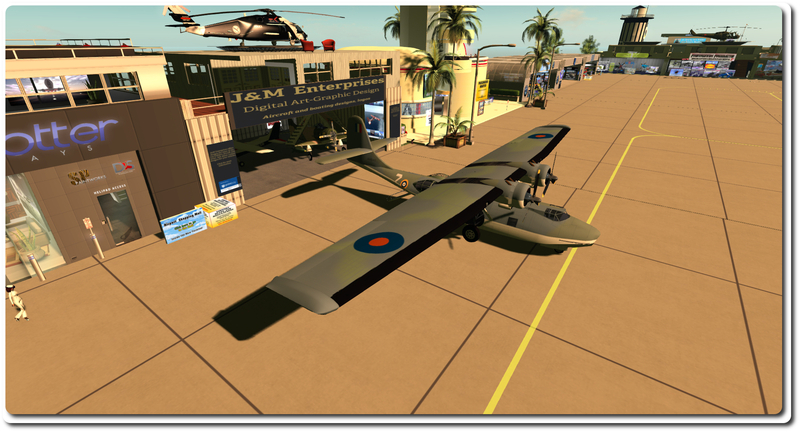 Dropping back to Josh’s hanger at the start of September, I was thrilled to see that he’d added not one, but two RAF Coastal Command paint kits for the Catalina to his range, both of which quickly went into my inventory. I should point out here that not only are Josh’s kits exceedingly good, they are also based upon actual aircraft – such as the Cousteau’s PBY (tragically lost in an accident), and the RAF kits are no exception. First up is FP225 (above). This aeroplane flew with No. 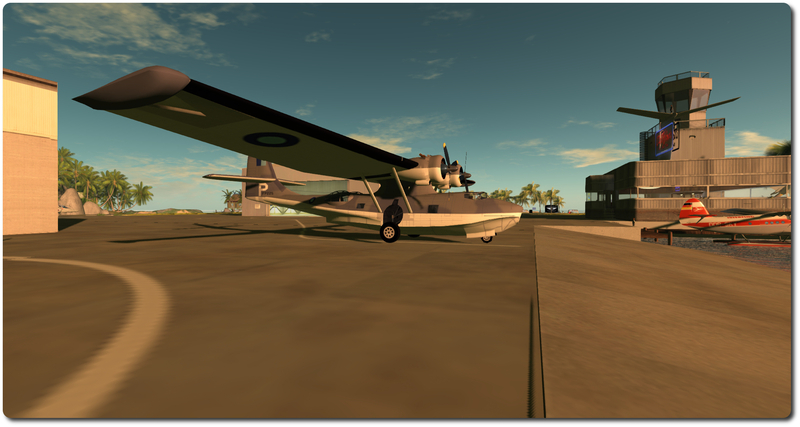 240 Squadron RAF Coastal Command, and was originally a PBY-5A Catalina. This squadron saw service in the Battle of the Atlantic before transferring to India, with FP225 serving in the squadron’s “special duties” flight – although I have no idea what that entailed. The second RAF paint kit converts the Catalina into AH545 / WQ-Z of 209 Squadron (below). This is the aeroplane, originally a PBY-5A as well, which located the battleship Bismarck in 1941, and has the more familiar RAF markings. If I’m totally honest, I have no idea how often I’ll fly The Catalina in RAF colours, I’m far too enamoured with the Cousteau Society paint work. But if you do see an RAF Catalina passing overhead, give a wave – it might be me (well, same goes should you see one in the white, black and yellow of the Cousteau Society!). In the meantime, Josh has done a lovely job with both kits, and with the Cousteau kit, and I have no hesitation in recommending his work. If you happen to own an aeroplane which has customisable paint options, you might want to check his hanger and see what he has on offer. Next up: getting a group of Catalina pilots together for some formation flying; that should be fun! On Wednesday September 10th, the RC channels should all receive the same server maintenance project, which includes crash fixes and an “obscure bug”. Describing the crash mode fixes at the Simulator User Group meeting, Simon Linden said, “The crash fixes aren’t normal usage but some edge cases that needed attention. The “obscure bug” was one that Maestro Linden had mentioned at the last Server Beta meeting, describing it as preventing Lindens from being able to leave Skill Gaming regions. Simon expanded on that saying, “It wasn’t just Lindens, but it was really anyone that didn’t have proper access.” Quiet what the proper access might be, isn’t clear. A separate issue with Skill Gaming regions is that some who have had payment information files with the Lab for some time, but who have not actually used it for a period of time, may have to refresh their information prior to being able to access such regions. Monday September 8th saw the Snowstorm contributions RC promoted to the de facto release viewer, version 3.7.15. 293376. This viewer includes assorted contributed fixes and updates, including the unified snapshot floater and support for ‘older than’ when inventory filtering). There has been a report of this installation of this viewer pausing with the message “unable to find Second Life Crash Logger”, but that clearing the message will see the viewer complete installation OK. As there are reports that this has happened with other releases of the viewer and where allow automatic updates has been enabled, it might be connected to the automatic update process within the viewer itself, possibly as a result of the viewer not shutting down correctly as a part of the automatic update process, although this is by no means certain. A new maintenance release viewer arrived in the release channel as an RC on Friday September 5th. Version 3.7.15.293253, which includes fixes for inventory and outfit management; appearance editing; group & group ban management; camera controls; multi-grid support for favourites; notifications management; stability, plus bug and crash fixes (download and release notes). The Lab’s new viewer autobuild process is now in the final phases of preparation for deployment, with Oz Linden reporting at the Open-source Dev meeting that there are only “minor fixes here and there” that seem to be required. There are expected to be some further updates to the new autobuild wiki page to assist self-compilers. The fix for this, submitted by Cinder under STORM-2053, is now under review, and so should be progressing forward soon. STORM-2053, “Viewer no longer asks for confirmation before ejecting a member from a group like in previous releases, also no confirmation for banning”, also submitted by Cinder is also in the same state. OPEN-268, “FFLOAD_XML missing on linux and darwin, FFSAVE_XML missing on darwin”, also from Cinder Roxley, may be a little more obscure, given it is apparently a long-standing issue which hasn’t previously been reported, but it to is progressing the Lab’s internal review phase. As noted in my SL project updates, the Lab is working on trying to improve group chat (see the Group Chat tag list for articles). While this doesn’t form a part of the Lab’s work, Cinder Roxley has submitted STORM-2079, “As a group member, I would like to opt out of joining chat”. The JIRA itself is still pending, but it highlights one of the ways in which some of the message load face by the group chat service might additionally be reduced. As previously noted, the major issue with group chat is not so much the volume of actual chat messages being sent, but with the number of updates the service must send as people log-in and out of SL, and as they join / leave group chat sessions. However, cumulatively, this still adds up to a lot of message traffic. So having a means by which users can opt-out of group chat altogether (and just receive notices, for example), could help reduce the load in terms of actual messages being sent and with the volume of updates for people joining / leaving group chat sessions. Firestorm already provides a toggle for opting-out of group chat either on a group-by group basis from within a Group Profile floater, or en masse via options in Preferences > Chat > Firestorm. However, these options only cause the viewer to discard incoming messages, they don’t actually reduce the volume of messages being sent by the chat servers. As a result of the JIRA and a brief discussion at the Open-source Dev meeting, there is likely to be some more poking around to identify where values relating to received group notices and chat are stored in the viewer with a view of seeing what might be leveraged towards helping reducing the volume of chat related traffic.